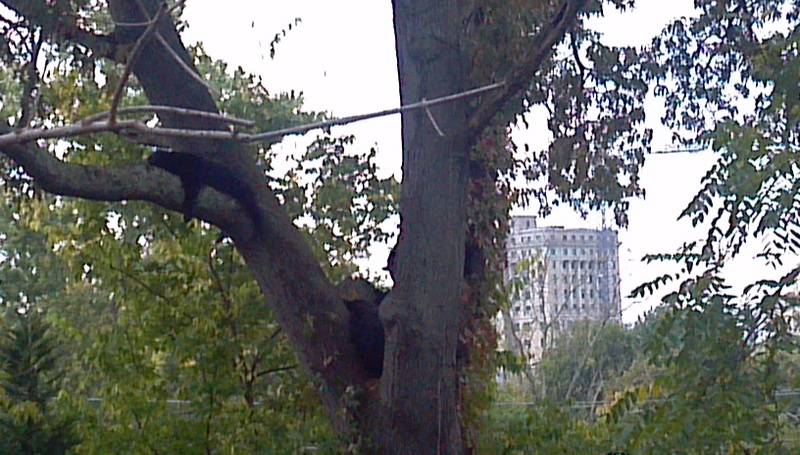 Our beehive is having a rough time right now. Not only have they been discovered by a band of marauding robber bees, they’ve also had some freeloading hive beetles and wax moths move in. To fight back, I called John Christie at Wild Mountain Bees up in Madison County and ordered some ammo: mite strips and hive beetle traps. And to help my bees re-stock their food supply to get them through the winter, I ordered some pollen patties. 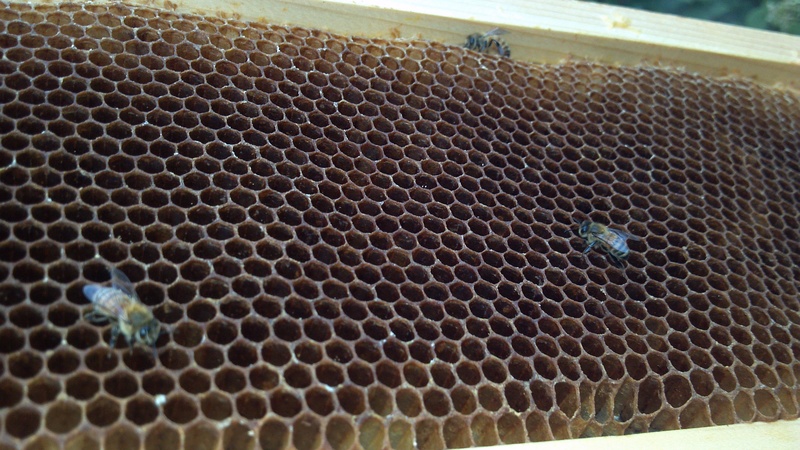 Since we got this hive back in April, tending the bees has been fairly low-maintenance. 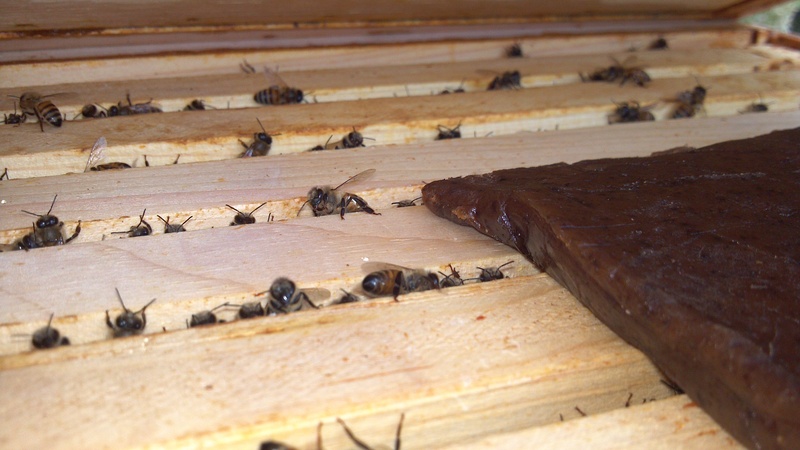 I fed them sugar water to get them established, and checked the hive every couple of weeks to make sure they were producing brood and building up a good supply of honey. All was well till I started noticing the tiny black shiny hive beetles scurrying around in the racks, then I realized every time I’d go in the hive there were more of them. Then we found some wax moth larvae (eww, vile grubby things) attached to the sides of one of the boxes. But the most alarming thing was that where there had once been racks full of honey, there was nothing. And it happened fast. Unfortunately, there’s not a whole lot you can do to prevent robber bees from coming in. Robber bees are just bees from another hive who’ve been tipped off by one of their own that there’s a good supply of food in another hive, and they make quick work of stealing it. 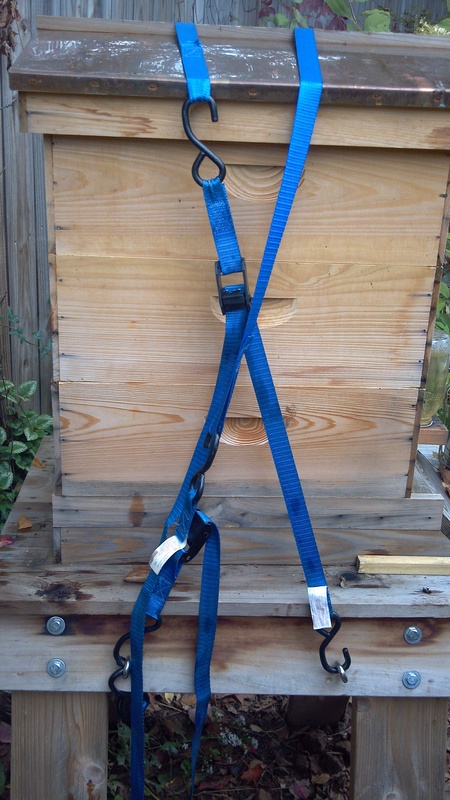 One thing we did was to put an entrance reducer on the front of the hive so that our bees would have less territory to defend. It basically is a strip of wood with a small notch cut out so that only a couple of bees can come in or fly out at once. I also put some grass and leaves over that entrance after a Google search informed me that would confuse the robber bees and they’d eventually give up trying to invade and go back home. This is not just happening in my urban beehive: it is happening in all my friends’ hives around the 28801 and 28806 zip codes. I sure would like to see the hives where the robbers are absconding with our honey. They must be strong and gigantic. These mite strips about knocked us over — they’ve got formic acid in them. 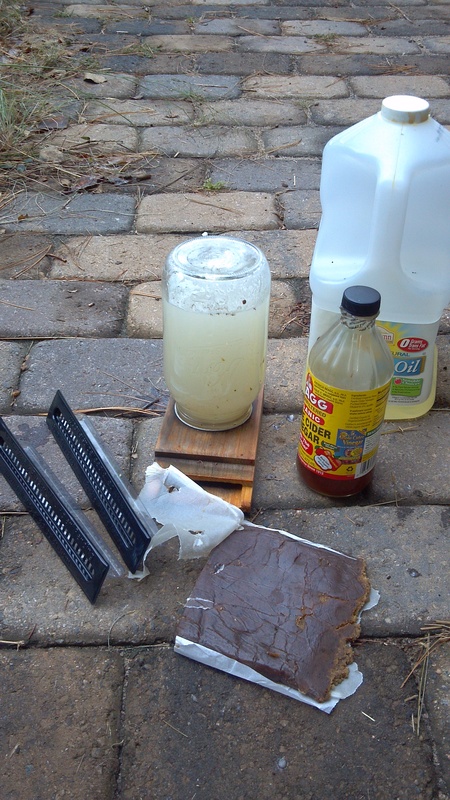 I don’t know what formic acid is exactly, but it smelled like the vinegar on steroids. I felt guilty putting them in the hive knowing the bees would be trapped in there with all those fumes, but I knew that unless we dealt with the mites we were at risk of losing the entire hive, especially since we’re headed into winter. 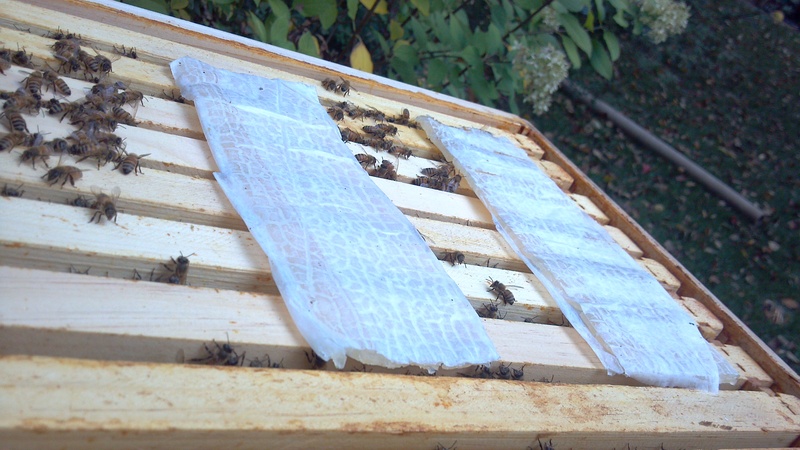 So my bees wouldn’t hate me forever after I subjected them to the formic acid treatment, after I took the mites strips out I immediately put in some pollen patties. Pollen patties look and smell just like PowerBars (I swear I didn’t taste one!) The bees started eating them as soon as I put them on top of the racks. The hive beetle traps are great. They work by luring the beetles in through small holes in the top with apple cider vinegar, then they get stuck in the vegetable oil inside. These little traps also sit on top of the racks. 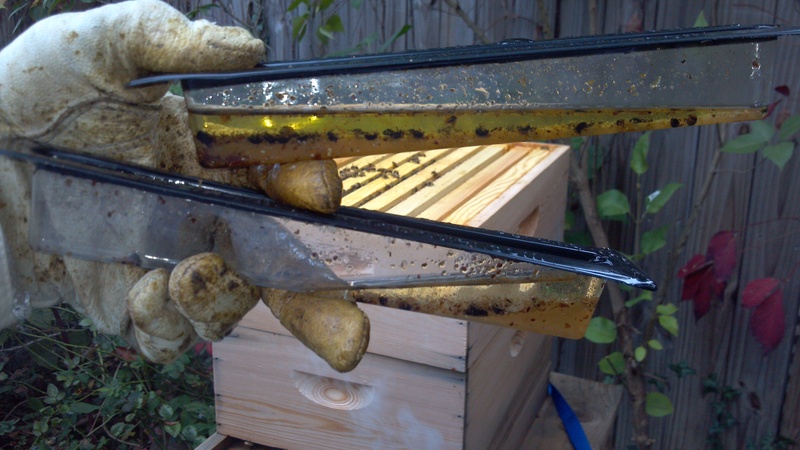 One note if you try them: be really really careful with the oil — don’t spill any inside the hive because any bee that touches it will get all gunked up and won’t be able to fly.